Amazonite is a beautiful blue-green mineral which can be found in the United States as well as other parts of the world. Although Amazonite is sometimes referred to as “Amazon Stone,” it does not come from the Amazon River, but it has been found in Brazil. 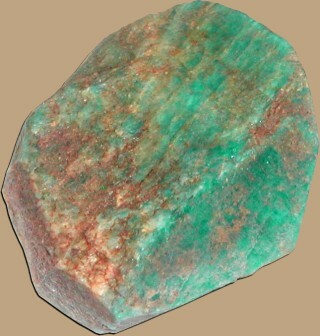 Amazonite is a green variety of microcline feldspar. In the United States, Amazonite has been found in both Colorado and Virginia. On the left is a specimen of Amazonite from Jefferson, Colorado.